Our featured cause is Teddy’s Tooth Troubles. If you want to donate to Teddy’s Tooth Troubles, you can donate between December 1st to December 31st, 2016 (money contributed after this time frame will stay with Bunnyzine) you can click this link to donate to Teddy’s Tooth Troubles. This 50 page Holiday issue is available to you for free! Hoppy Birthday to Bunnyzine! This issue commemorates the first issue launched exactly one year ago. We are very happy to have carried this far and we hope to continue to bring you more fantastic issues of Bunnyzine. This issue is dedicated to to all those beautiful buns that may be different for being disabled but they are no less loved and no less happy. We stand behind the phrase “Different is beautiful” and headlining this theme is none other than Dolly, the disabled bunny. She might have binkied to the bridge but she is forever loved and remembered. 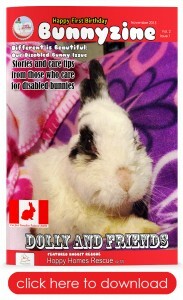 She’s also the first Canadian bunny we’ve featured in Bunnyzine (which is a bit weird since I am Canadian :P) and our featured rescue, Hoppy Homes Rescue, is the rescue that helped Dolly find her forever home. Also in this issue is a collection of articles from various people who have disabled buns. They share their stories and their care tips with us. 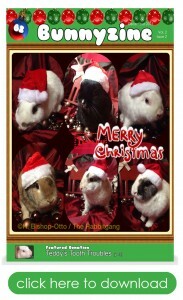 We also have the next set of fb bun pages that we hope you will become followers of. This 42 page Halloween edition is available to you for free! FREE! FREEEEEE!!!!!!! !